Last Sunday we were playing an Out of the abyss campaign. The PC’s are about to finish the campaign, they are level 14 and pretty maxed-out. During the rage of demons, prior to the fight with Demogorgon, they fought a Balor. My players are somewhat new to the game, except for one of them. They were scared because of the picture but knew little else about the monster’s abilities. During all this battle sequence there had been several occasions in which an explosion caused debris to fall on them, forcing a DEX save to avoid half the damage. It was very little damage (3d6), it served more for the ambient and general tone and setting. It was an immersion touch. Back to the battle, at the end of it, two players were inside the death-throes range of the Balor when it was killed, but they did not know about this. I narrated the last moments of the fiend and how its skin cracked and burst in a fiery explosion. Fighter and cleric throw DEX saves and fail miserably. It’s 20d6 of fire damage but they did not know this. I started gathering dice from all over the table and they panicked. They asked me how many dice I needed. I told them the truth and that is the moment when the fighter player went all metagame batshit. 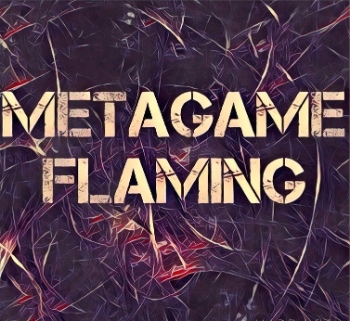 Metagaming is the use of Player knowledge to the benefit (or not) of the fictional character. Fortunately he is an agreeable person and decided I was right after all. They barely survived the death throes explosion. I believe that this approach is always best as it helps retain immersion, that is a big thing, in a world where two players are on the phone checking Facebook and the other is telling a joke, doing our best to hold onto what little immersion is left is paramount. Some players take a more difficult position and insist on their metagame-ish course of action, saying that “that’s what my character would do !!!”. Well yes, I get it perfectly, that’s what Bob the monk would do if he had all your knowledge….. But he does not. So my advice to new DM’s if a situation like this comes up is to put on the big boy’s pants, and say “no” to said player and do not give in to player pressure. Surely nice people will understand perfectly that the action he/she is suggesting is not in the realm of possibilities since it requires unknown information. If a person will not accept this ruling then it is probably for the best to stop playing with him/her. Well… rant over, thanks for reading.